Ben's blog -- yeah yeah yeah -- whatever.. This year - they came back! 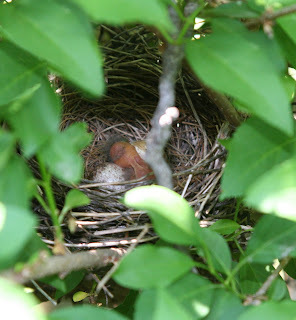 and they made a home in my forsythia. I noticed it last week when the female flew from the bush and startled me. 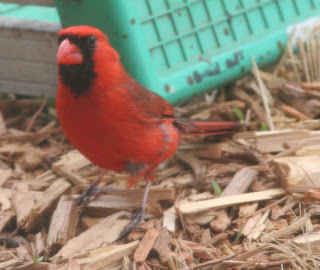 Then it was just a nest... last week it was 3 eggs.. today -- I have a baby red bird! eeep! eeep! eeep! I love baby birds! 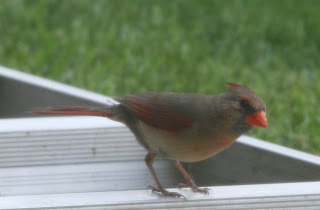 We have a husband and wife cardinal duo who bathe themselves daily in Hannah's water tub on the deck --it's great to watch! I'll try and get a picture of them for you.